Backing up an iPhone is important because it allows you to recover all of your personal data, apps, and stuff, if you ever need to restore the iPhone, upgrade it, or replace it with a new phone, all of which is done by restoring from the backups that are made. 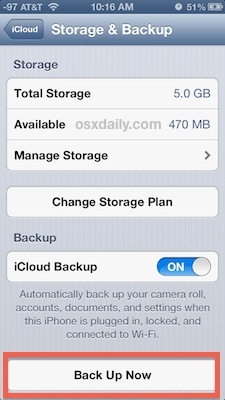 By default your iPhone will automatically sync and create a backup itself, and this can be done one of two ways. The first backup method is handled by iTunes each time your iPhone is connected to your computer through USB. Otherwise, newer iPhones will automatically back up through iCloud if that feature has been enabled, and those iCloud backups happen anytime the device has been plugged into a power source and is on wi-fi. While the automatic backups are extremely useful and you should always use at least one of them, be it iTunes or iCloud, you can also initiate an instant backup of an iPhone manually. 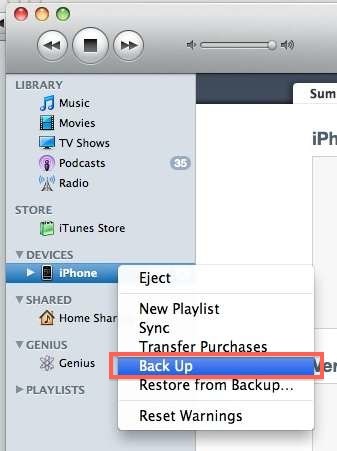 These self-started backups can be made from either iTunes or iCloud very easily, here is how to do either. Initiating a backup with iTunes is often the fastest method because the tethered USB connection is quick and doesn’t rely on the speed of internet service. This will create a backup of your iPhone that you will be able to restore from later, and the procedure is the same in Mac OS X or Windows. It is a good idea to create a current backup before you download and install the latest iOS version. There is no limit to the amount of backups that can be made through iTunes, you could technically have a thousand of them if your hard drive capacity would support it. Additionally, you can have backups stored both on a computer as made through iTunes, in addition to iCloud, which is the backup procedure we’ll cover next. Backing up to iCloud is very easy and can be started manually at any time. The potential downsides to iCloud backups are the limited base storage (5GB) which fills up quick without paying for more, and, perhaps more importantly, is that iCloud backups are dependent on the speed of the internet connection. Thus, if you’re on a slow network or do not have network access, you will need to use the iTunes backup approach instead. While you are in the iCloud Backup settings screen on the iPhone it’s a good idea to enable the service if it hasn’t been turned on yet, this is done simply by toggling the “iCloud Backup” switch to ON. To use iCloud backups you must have an iCloud account set up and configured on the iPhone, and available space on that iCloud account for the backup. Does this work to backup my iPod touch or iPad? Yes, these backup procedures are exactly the same for all iOS devices, whether backing up an iPhone, iPod, iPod Touch, Apple TV, or iPad, it is all the same process and handled through iTunes or iCloud in the exact same manner. How to back up notes and calendar on iphone to computer? Does the ‘Back Up’ on itunes also back up these two automatically? If you want to backup/analyze your iPhone, you can get the DataPilot software. G’day, I can’t see the “Backup” option on iTunes to 10.1.0.56 for my iPod Gen2 8GB. Plus there is no backup existing in my “…\application data\…\backup” directory. Damn satellite cut out halfway thru update by iTunes so I direct downloaded iOs 4.2. So what if i haven’t put iTunes on my computer ? Its there another way to back up my iPhone? i have an iphone 4 with ios 5 and everytime i go to back up everything it comes up with the message on my itunes “itunes could not back up the iphone “iPHONE” because the backup was corrupt or not compatible with the iphone. do you have any suggestions? Thank you for this guide. I feel stupid as I did not know this function existed at all. Is there also possibility to only backup the iPhone contacts – without the rest of my iPhone data? Use a dedicated program. There are many if you are on PC – use CopyTrans Contacts to backup your iPhone contacts. If you are on Mac, the native Address Book application will help you achieve that. Mine doesn’t allow me to choose Back up when i right click on my iphone under devices. why is it? does it always automatically do the back up when you plug it in? I have a problem with my icloud contacts being duplicated can anybody please help me remove the duplicates ? I’d use CopyTrans Contacts to back up my iphone contacts. Why? Because the backup made via iTunes requires you to restore your whole iphone data and settings to a previous state. I can’t update my iPod. My iPhone#5 is disabled with failure attempt of passcode how i can resolve this problem without losing data or with losing data?